Could a Handful of Dice Get Your Bilingual Kids Speaking More (And Improve Their Math Skills, Too)? In fact, my kids have become so feverish about rolling these dice every night before bed that I’m beginning to worry about a gambling addiction. Of course, I can’t guarantee that a handful of dice will hook your children, too—this will largely depend on their age (from roughly 5 to 12 is best, I suspect) and their personality. But I think it’s safe to say that the act of rolling dice holds a powerful appeal—for any age, really, including adults—and this special magic may attract your kids, too. If it does, and playing with dice becomes something they’re eager to do, then try turning this to your advantage to encourage use of the minority language from reluctant children: if they want to play with dice, they have to use the target language with you. I realize that the success of this rule will depend on your particular circumstances, but since dice games are largely limited to numbers—they don’t require a whole lot of fluency—perhaps this will help make the challenge more achievable, even if your kids normally hesitate to use their “weaker” minority language. Each player rolls one or more dice and the winner has the highest total. Turns can be taken, or if you have enough dice, players can have their own and the rolling can be done at the same time—which is faster and more exciting. Each player rolls one or more dice and the winner has the lowest total. Again, turns can be taken, or the players can roll simultaneously with their own dice. Players have their own dice (at least two), and must be the first to roll the agreed total: seven, ten, etc. This total must be the exact sum of the player’s roll. Players have their own dice (one or more), and must be the first to roll the agreed target: a six, or two sixes, etc. For more difficult targets, like three sixes, players need not get them all in one roll; after getting a six, they keep it and roll the remaining dice until they reach the target. Your kids will probably be eager to set these targets themselves, but if not, solicit their ideas. Players have their own dice (at least three), and must roll a “straight”: a sequence of three (or more) numbers. For example, “two-three-four” or “four-five-six”—any “straight” is acceptable. The first player to roll a “straight” is the winner. Players take turns rolling all the dice. Before a player rolls, he declares a target number, and he gets one point for every one of these numbers that appears in his roll. (Each player can choose the target number he likes, from one to six—it’s up to the individual player.) For example, if I choose “three” as my target number, and I roll four “threes,” I get four points. The player with the most points after one round (or the total of multiple rounds) is the winner. P.S. For older children, Yahtzee is a classic dice game that I recommend highly. And since the focus is on numbers, it can be played in any language. How about you? 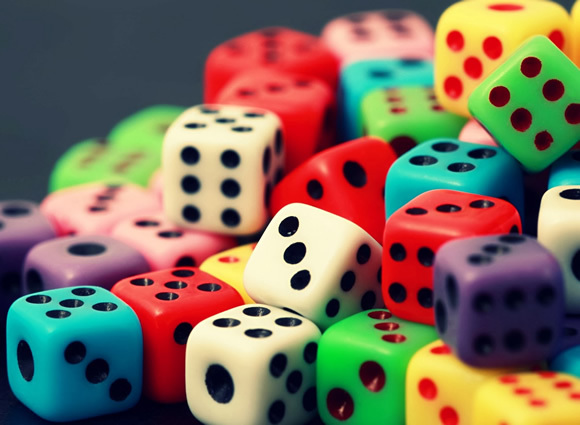 If you tried these dice games, how did it go? Did you discover any new variations? I have to admit using dice never occurred to me, but I think I will give this a shot, especially since my husband has a large collection of dice (he used to play D&D when he was younger so we have a large variety)! Previous post: What’s the Best Book About Raising Bilingual Children? Next post: Your Child Wants to Be Bilingual!